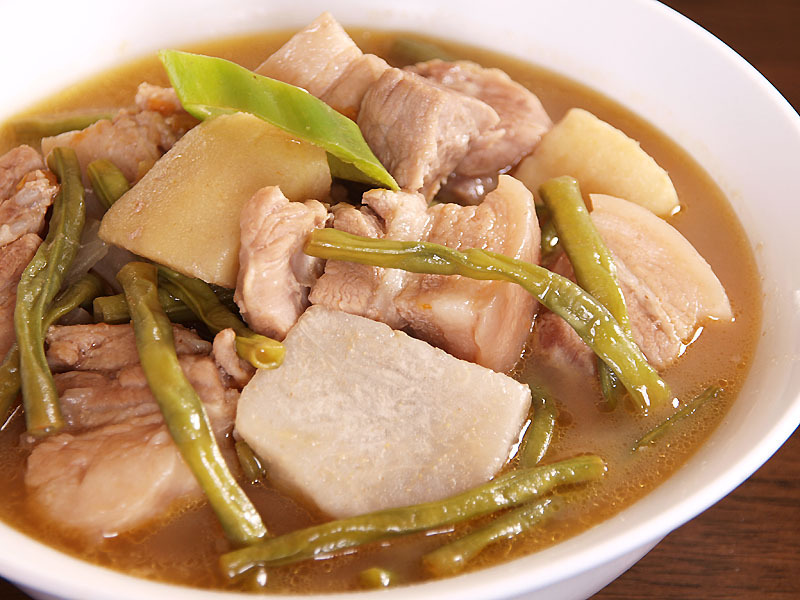 Most of the Filipinos love sinigang specially the tamarind based variant but there are a lot of variations of this lovely soup dish, ingredients can vary like the use of different meats and vegetables but the stock or souring agent is barely changed as the tamarind will be the first choice for this dish. There are some lesser known souring agents used also in this dish like guava, calamansi, lemon, balimbing (star fruit), kamias (bilimbi), raw mangoes, santol (wild mangosteen) which I suggest every sinigang lover should try because you will definitely have different experience on each of these variants. For this post I will use guava as I had recently tried it when we had a dinner at our friends house and since then I started craving for it so I have to make my own at home. It has that guava sweet taste but I added some tamarind hint to it so it will still have that tangy flavour as this dish is the least sour among the souring agents I mentioned above. Add guavas and continue to simmer for 15 minutes. While boiling add the kangkong leaves and cover, turn of the heat. Whoa, I thought using guava solely would make it ‘sinigang’ tasty.. adding a packet of tamarind mix is the secret?? What an interesting combination of flavours – I have never tasted guava with pork before. It looks very nice. Thats an interesting and unusual combination, never heard of anything like this. I came across guava in pork-soup by accident. Adding to the pork-soup Frozen “pork skin”, which was frozen guava. Turned out to be a very tasty soup. Shall make it again. Just do not bite hard on the pips. Have not cooked anything with guava, will try by making some soup first. Seriously awesome looking! I think you have the Midas touch, especially with soups. Kudos to you for doing a great service in promoting Filipino cuisine to the world. Our cuisine is so underrated… its getting its bit of attention because of people like you! Mabuhay ka! I just wanted to let you know that you are a Genuine Blogger. Celebrate your blog, as it is comes across to the reader as heartfelt and genuine. There are no rules with this honor. Accept it and relish in the thought that your blog is “award worthy” without having any strings attached. If you choose to give this award to a deserving fellow blogger, please do so with no “rules.” Award it to someone for his or her genuineness in blogging. Free and clear. Wow this is a real pleasure! This Sinigang looks delilsh and divine! I can just savor the broth and smell the aroma of the guava within the soup. Great post! Hey Raymond! This looks and sounds amazing! I am able to get my hands on pretty much all the ingredients except for water spinach… Any good substitution? I tried guavas today, and you’re right–they’re not as sour as we thought they’d be. Make sure the seeds are removed, as they can be a nuisance while eating the sinigang!